Persimmons are a genus of trees belonging to the Ebenaceae family, best known for ebony and persimmons. 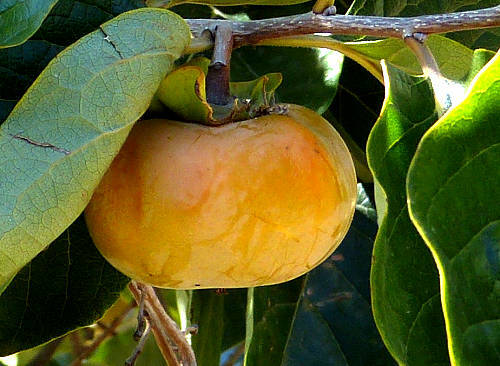 The scientific name Diospyros translates as "divine fruit". Diospyros kaki: Asian Persimmon is the most widely cultivated and has thousands of cultivars. A few other persimmons are edible, although some barely palatable. These include D. lotus: Date-Plum (originated in southwest Asia and southeast Europe and known to the ancient Greeks, still in limited cultivation), D. discolor: Mabolo (Philippines and Asia), D. nigra: Black Sapote / Chocolate Pudding Fruit (Mexico), D. virginiana: American Persimmon (hardy in USDA zone 5-8, in limited production), D. peregrina: Indian Persimmon (India), D. texana: Texas Persimmon. Mature Size: 25' high and at least as wide. Flowers: Inconspicuous, fragrant. Male flowers occur in groups of three, female flowers occur singly. Usually male and female exist on separate trees but both can appear on the same tree, and rarely, perfect bisexual flowers appear. Self-fruitful: Many (female) cultivars will produce seedless fruit without pollination. Some will need pollination. 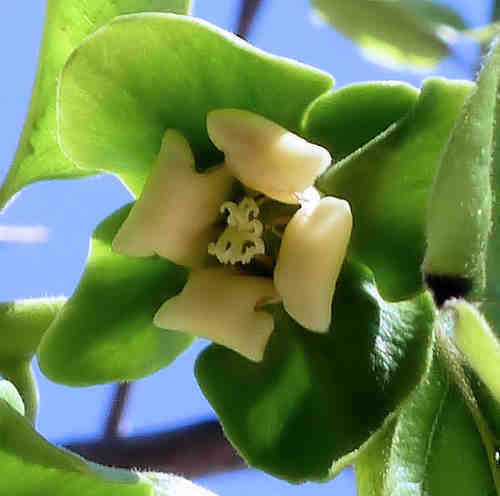 Pollinated flowers may produce seeded fruit that is larger and different than unpollinated ones. A second cultivar nearby often increases the amount of fruit. Fruit: Spherical to oval, with an indented stem and four sepals. The skin is thin, waxy, and yellow to orange-red on the outside when ripe. The inside of the fruit is thick and pulpy, with a soft to fibrous texture. Seeded varieties may have up to 8 seeds. Persimmon cultivars fall into three groups: astringent, non-astringent and pollination-variant (astringent when seedless). The immature fruit have a high tannin content with a very astringent taste. As they mature, non-astringent cultivars like 'Fuyu' lose the tannins and become sweet when fully colored and still hard. Astringent cultivars like 'Hachiya' do not lose the tannins when fully colored and become edible only after they change to a very soft, custard-like consistency. Months for fruit to ripen: 6-8. Harvest the fruit when fully colored but still hard, to avoid bird predation. Use clippers to cut the stem just above the calyx (green leaf-like structure between the fruit and the stem). The fruit tend to persist on a tree for several months after ripening. They will continue to ripen after harvest, especially when placed in a bowl with apples or bananas. Fruit that are not fully colored will take much longer to ripen off the tree. Storage after harvest: Several weeks at room temperature. The quickest method to remove astringency from astringent cultivars like 'Hachiya' is to place the fruit in a freezer for 24 hours. When thawed, the fruit are non-astringent. Otherwise, place them in a bowl and leave them for several weeks until they are very soft. Some cultivars, such as 'Fuyu' and 'Suruga', suffer chill damage in refrigeration, but can be frozen or kept at 30-32°F, not above. Other cultivars, such as 'Hachiya', can be refrigerated for up to one month, encased individually in plastic bags. Do not expose to other ripening fruit in the refrigerator. Persimmons can also be peeled and dried, whole or sliced, when hard. This will make even astringent varieties sweet and ready to eat. Leaves: Medium to dark green, broadly lance-shaped, smooth margins, stiff. Roots: The rootstock most commonly used for grafting is Diospyros lotus. D. kaki itself has a deep tap root and some cultivars may not be grafted. 'Chocolate' small to medium size fruit, sweet, spicy, firm brown flesh, self-pollinating. 'Coffee Cake' medium size fruit, sweet, spicy, cinnamon-like flavor, needs another cultivar such as 'Chocolate' as pollenizer. The fruit will be astringent if not pollinated. 'Fuyu-Jiro' medium size fruit, sweet and mild flesh, keeps well, the tree is vigorous, spreading, productive. 'Giant Fuyu' large fruit, sweet, flavorful. 'Izu' medium to large fruit, sweet, flavorful, smaller tree, 100 chill hours. 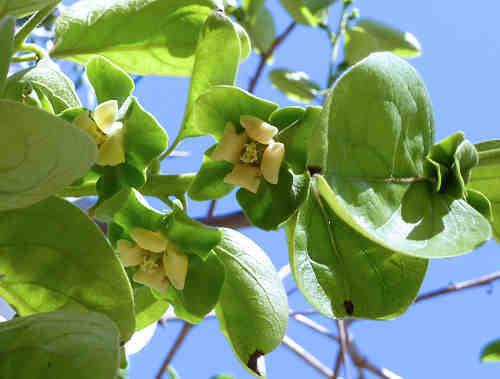 'Hachiya' large fruit, sweet flesh, good for drying, the tree is vigorous, upright-spreading. Wildlife: The fruit attracts birds and mammals. Origin: China. Cultivated for more than 2000 years. USDA hardiness zones: 8-11 ('Fuyu'/'Hachiya') otherwise 7-11. Chill hours: 200. If leaves emerge during an early spring warm spell, they can be killed at 26°F by a late frost. Heat tolerant: Somewhat. This plant does better in temperatures below 90°F. Temperatures over 100°F may kill the tree unless it is mulched and watered every two days and grown in enriched soil. High temperatures reduce the size of the fruit crop. Drought tolerant: It needs water every six weeks to every two days depending on temperature. Water after becoming established: Every two days in high heat to once a month in cooler temperatures. Fruit drop occurs with insufficient water. Use double-ring basin irrigation to water at the drip line and away from the trunk. Start in the spring and taper off in the fall. Soil: Well drained, tolerant but does better with moderate to high organic content, needs low salinity, deeply dug if using kaki rootstock, pH 6.6-7.5 (neutral). Fertilize: Do not fertilize unless leaves are not dark green or shoots grow less than one foot a year. Use an organic fertilizer in mid to late winter. Excess nitrogen causes fruit drop. Mulch: 1-2" organic material to reduce evaporation and cool roots. Prune: In early winter to develop a strong structure. Flowers appear on the current season's branch growth. Litter: Leaves in fall. Messy fruit drop if not harvested. Propagation: Seed or grafted cutting. Other common names are Japanese Persimmon, Kaki, Chinese Plum and if dried, Chinese fig. Persimmons are very popular in Asia but a minor fruit in North America. 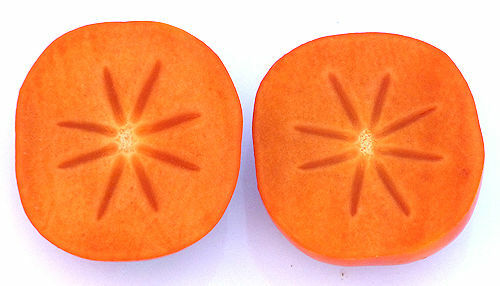 The bottom picture shows a Fuyu sliced horizontally.